Once upon a time there was almost nothing, as there often is. Green fields, sylvan glades and a pleasant park in Grosvenor Square. Then all of a sudden, at the heart of the Square sat All Saints Church. 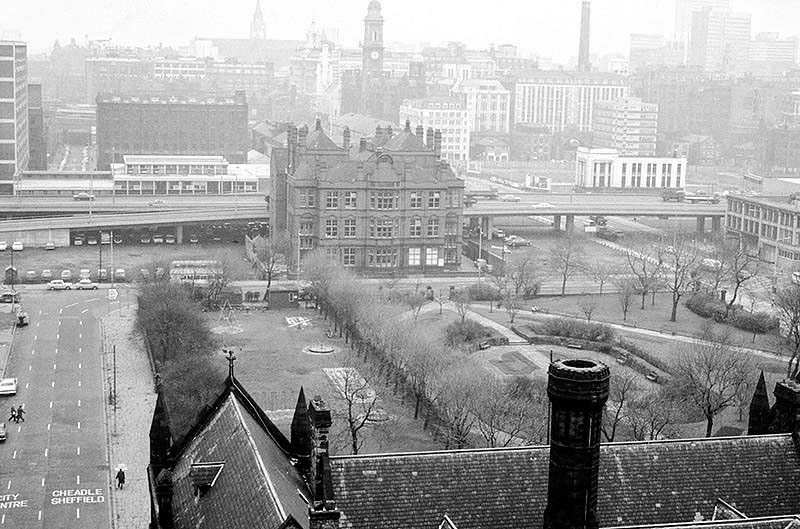 Underneath Manchester’s All Saints Park is a hidden history – an estimated 16,000 bodies. For this was the site of a former Victorian Cemetery, set up to cater for the parishioners of All Saints. All Saints Burial Ground officially opened on Wednesday 19 April 1820. The first interment was that of twenty-one-year-old Fanny Knowles, who lived on London Road. Her funeral was conducted by the founder himself, Charles Burton. It would be another month before the next interment took place. In the first year burials were slow with only 55 interments, however, by 1851 the number had increased to over 600 per annum. The whole area having been a centre of housing, education, entertainment, commerce, public services and worship, was becoming the fiefdom of first the Polytechnic and subsequently the Manchester Metropolitan University. But formerly there were peoples’ homes here. Then the 1960s saw a huge programme of slum clearance in Manchester and whole communities across the Square and nearby Hulme were moved, rehoused in a thoroughly modern milieu. Rightons haberdashers has survived though no longer haberdashing, having been amalgamated into MMU. The Manchester Municipal School of Art was built in Cavendish Street in 1880–81 to the designs of G.T.Redmayne. The fascia has been retained but the name has not been changed to protect the innocent. Next door the Chorlton on Medlock town hall still has its portico in place, the adjacent Adult Education building has been surgically removed. Richard Lane, the architect of the Friend’s Meeting House on Mount Street, designed the Chorlton-on-Medlock Town Hall on Grosvenor Street. It continued in that role from 1831 until 1838 when Chorlton-on-Medlock became part of the city of Manchester. In the years that followed it was used by the local community for a variety of functions but the redevelopment of the area meant that the local population diminshed and the building became redundant. In 1970, the interior was removed, a new structure added to the rear and it became part of the Polytechnic which became the Manchester Metropolitan University. The Fifth Pan African Conference was held there between October 15th and 21st in 1945. Ninety delegates from across Africa, Europe and the Caribbean, attended the meeting and among the delegates were a number of men who went on to become political leaders in their countries including: Hastings Banda, Dr Kwame Nkrumah, Obafemi Awolowo and Jomo Kenyatta. Former Chorlton Poor Law Guardian’s HQ then Registry Office, now the Ormond Building of Metropolitan University – and at the far right edge St Augustine RC. The Manchester Ear Hospital on Lower Ormond Street, shortly before being transferred to Manchester Royal Infirmary. Most of the building was demolished, but the facade retained as part of MMU’s Bellhouse Building. To the right the Presbyterian Church. The memorial stone on the front of the school, laid on June 17th, 1908, declared that it was the Forty Seventh Municipal School. Strangely, it seems that it was called the Cavendish Street School despite the fact that it wasn’t on Cavendish Street. It was subsequently utilised by the Polytechnic sculpture department – then demolished to make way for something else of an educational nature. Some or all of our social and architectural history has been overwritten, lost or swept aside by the tide of history. Though on a dark snowy night you can still make out the bright red corporation buses, passing by in a dark cloud of diesel.